enable the building demand to be met. Expanded polystyrene (EPS) building systems are commonplace in the rest of the world primarily because of EPS's thermal insulation properties and light weight. The ABPPolyblock system is based on proven technology used internationally for the past 35 years. The block stays in place acting as a thermal insulator for the building. The EPS block walls are 30mm thick. ABPPolyblock 'K' is a knock down block where long distance transport is an issue. 1) Build foundations, either strip or raft as normal keeping foundations as level as possible. Foundations should be stepped by 300mm to suit the height of the block. 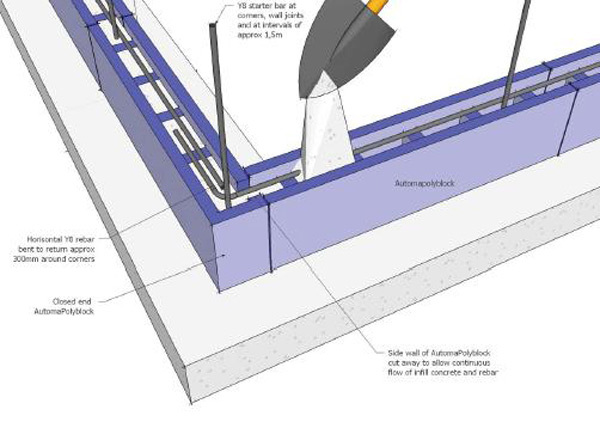 2) Place 1m long starter bars in the foundations (100mm deep) at corners, wall joins, on either sides of windows and doors with spacing between1,2 -1,5 m between bars. 3) Place first row of ABPPolyblocks to floor plan leaving spaces for door frames. Ensure all blocks are level. 4) Insert first Y8 horizontal rebar continuously above first block bending around corners by 300mm. 5) Place ABPPolyblocks 3 high and fill with 15MPa concrete. 6) When concrete set place next 3 rows, fit windows or formwork for windows and continue to fill with concrete placing further 1m lengths of rebar vertically, in line with the starter bars. 7) Use timber or fibre cement formwork above window openings to hold concrete in place above window openings. 8) Above windows and doors insert 2 x Y8 rebar lengths continuously on top of first block above openings to create ring beam and lintel. 9) Attach hoop iron or wire to the ring beam to secure roof sub structure and fill with concrete to wall top. 10) When wall work complete and internal concrete fully set, plaster with Polyplast plaster solution to 6mm thickness. Polyplast keeps homes warm in winter and cool in summer saving energy costs involved in heating and cooling. Easy to carry and position. 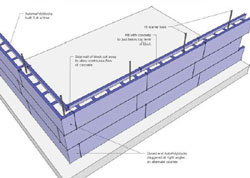 ABPPolyblock walls filled with concrete are about 50% lighter than equivalent sized brick walls. 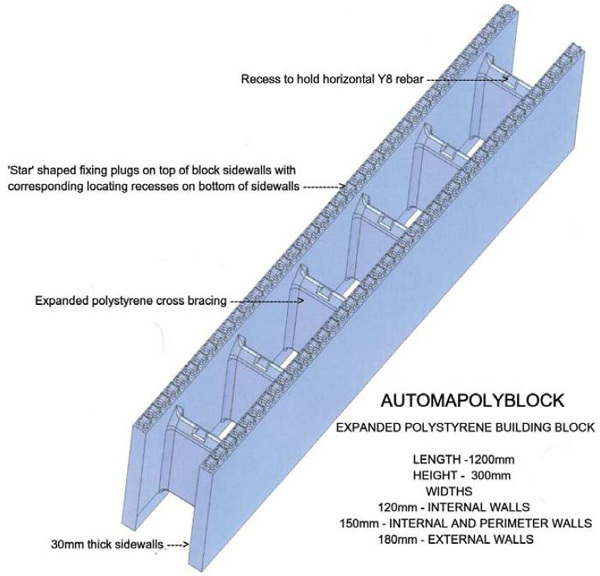 ABPPolyblock modular blocks are dimensionally accurate, equivalent in size to 36 bricks and the patented locating mechanism locks the blocks together easily and tightly. 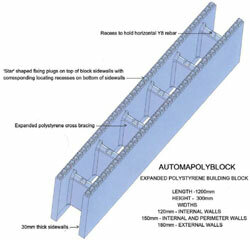 The structure of the ABPPolyblock system is reinforced concrete which is 2-3 times stronger than brick. Walls can be built up to 5 times as fast as brick with building rates of 50m2 per day per building team readily achievable. EPS is water impermeable and the ABPPolyblocks therefore create a moisture barrier. 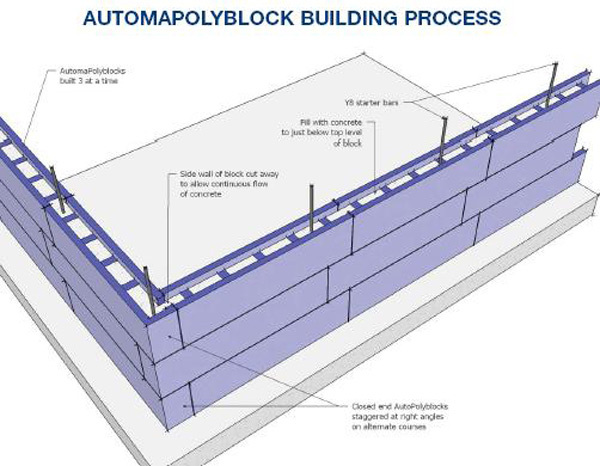 Considering material cost and speed of building constructing with the ABPPolyblock system is competitive with building with brick. EPS is resistant to rot, bacterial and termite attack and degradation over time and will retain its thermal insulating and moisture barrier properties for the life of the building.